After languishing for close to two years the prestige end of Melbourne’s property market is bouncing back with a rise in million-dollar sales, and the trend is likely to continue, albeit slowly, throughout 2014. The Age reported that last year one in eight houses sold for at least $1 million. A year earlier it was one in nine and in 2010 it was one in seven. Interestingly every house sold in Canterbury and Middle Park, a total of 182, topped $1 million. 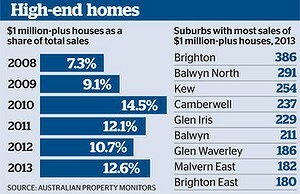 But Brighton, Balwyn North and Kew had the most million-dollar sales in 2013, as the following chart from Australian Property Monitors shows. Despite the rise in million dollar sales, and homes retracing their falls in value over 2011 and 2012, the price of most homes at the upper end of the Melbourne market are not yet back to their peak levels of late 2010. With a few economic and business speed bumps ahead for us I can see buyers in this category holding back a little until the economic landscape becomes clearer.